"My name is Irma Abraham the founder of Healed Enough To Help " The Healing Network for MOMS". I have nothing but great things to say about Stacie Walker. She puts her whole heart into what she does and that is pushing women to their fullest potential. She makes you realize that you are all you need to succeed or fail. Stacie's approach is cutting straight to the chase but all in love for the individual she is working with. I have Stacie's voice saying, " Irma you need VISIBILITY in order for people to see the VALUE you possess" ... Stacie is a wonderful person to work with with." Stacie was my very first coach, our stories are eerily similar, and without her idk if I would have ever put out an offer or become the incredible coach that I am today. 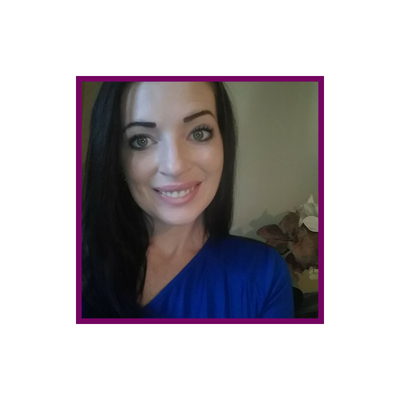 "Amazing changes have happened for me just applying Stacie's strategies and she has really helped me find how to make my message clearer and directed towards who I really want to work with. She's been a HUGE influence in my world. She does relate from her own experience and has such a compassion to help other women succeed. Her knowledge and care is a game changer for real. I appreciate you from the bottom of my heart Stacie!!!!" "Stacie has come into my life at just the right moment. While I have been surrounded by amazing, positive people and mentors - Stacie is the right person for me right now to take my business to the next level. Before working with Stacie I had hangups about money and blocks about whether I was worthy enough of being abundant in my business. While I was creating content, I was challenged by not knowing how to get my offers out to my audience effectively and successfully in order for me to earn an income. This is all shifting for me right now and I attribute that to Stacie's ability to see things that I am unable to see. Namely piecing together my talents in a simple way without over-complicating things. Also not only does she see the best and infinite potential in everyone professionally, but her friendship and belief in you will allow you to believe in yourself. I'm thankful to have Stacie in my life!" "I absolutely adore Stacie. Not only is she brilliant, she is one of the most authentic and passionate business owners I have had the pleasure of speaking with. She’s sharp-witted and a wonderful leader - it’s no wonder she does this for a living. When you have a natural talent for something, you’ve gotta listen to it (and listen to her podcast while you’re at it)." I’ve learned priceless tools from this beautiful soul. She practices what she preaches. And she shares her wisdom and hacks to help you become all you can be in your business and DEFINITELY not the Army😃. "I'm thrilled that I have made such an amazing connection and friend in this entrepreneurial wold. In learning about what she does and how she strives to empower other women entrepreneurs, I fell in love with her contagious spirit and selfless way to help other women thrive and succeed in their businesses and in their own lives. I can't wait to learn more from Stacie - she's truly inspirational." "Before I met Stacie, I was clear about some things but where my business was concerned, I kept self sabotaging. Procrastinating and kept doubting my self about fully stepping out in my daily operations. Then I met Stacie. It was a divine connection. Stacie helped me to be totally clear about how I should run my business, broke down every thing for each month so I would know what I should be doing in each month and days, her coaching helping me to put out my offerings so can make the the finances to fulfill my dreams. I now feel confident, relieved and happy knowing that I am on the right track to where I would like to go. I would recommend anyone who is watching Stacie to make the decision to work with her. She would definitely help take you and your business to the next level." "Stacie Walker is a God-sent. She is the answer I have been searching for for so long; such a breath of fresh air in the cloudiness of the online world. I joined Stacie's online community just a few short months ago and has had more personal growth in The Elite Society of Ambitious Women than I could ever imagined. 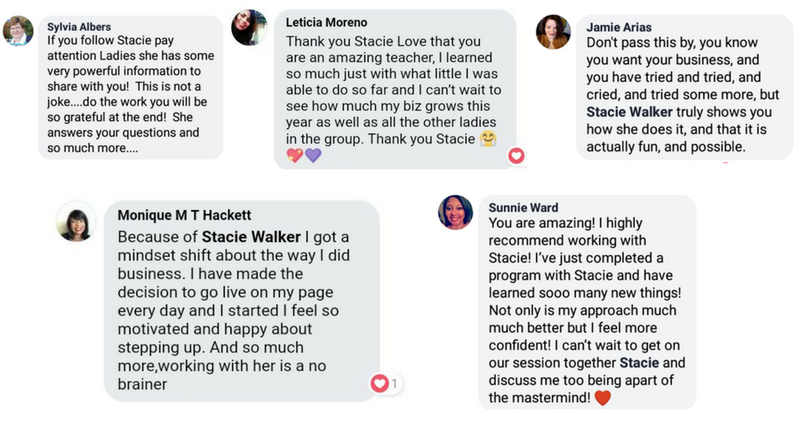 In addition to all the love and support from Stacie and the Elite Ladies that she has attracted, the opportunity to go live in this community is so empowering and is the boost of confidence I absolutely needed to move forward with my mission. In addition, since I have been coaching with Stacie, I have gain the clarity, confidence and direction necessary to success as an entrepreneur in the online space. This is exactly what is needed if you want to succeed as a business owner today, we have more information that is needed and to many gurus who are only willing to share excessive amount of information with no direction. Because Stacie shares her behind the scene methods and how-to's with her students with full disclosure and accountability, you will success. I would give working with Stacie my highest recommendation any day of the week."